← Have You Tried: Rutabagas? Have You Tried: A Pomegranate? 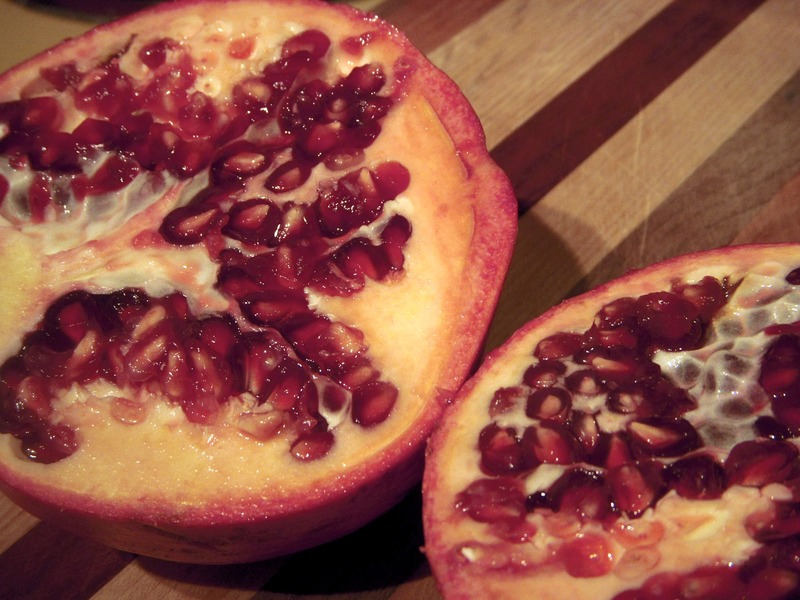 Pomegranates are tasty fruits, and the edible part is actually the pulp-encompassed seeds. In the United States they are mainly grown in warmer places like California, so they are a treat that I don’t often buy for myself. Luckily though this one was a gift. I love gifts of food! Pomegranates can be messy to cut and de-seed, so it’s not surprising that there are a number of methods for removing the seeds. I used to always use the underwater method, but then I read over and over again about a newer method of cutting the pomegranate in half and whacking at it with a wooden spoon. That sure seemed easier, but when I tried, only a handful of seeds fell out, no matter how hard I hit it. Sooo I went back to the underwater method. I received Yotam Ottolenghi’s cookbook Plenty (I got the UK version, the US version is available for pre-order if you’d like to see more familiar units of measurement!) as a Christmas gift, and I can’t wait to cook every single item in it. Bear with me please! Since I obviously wanted to make good use of my pomegranate, I decided to make Ottolenghi’s Aubergine with Buttermilk Sauce. 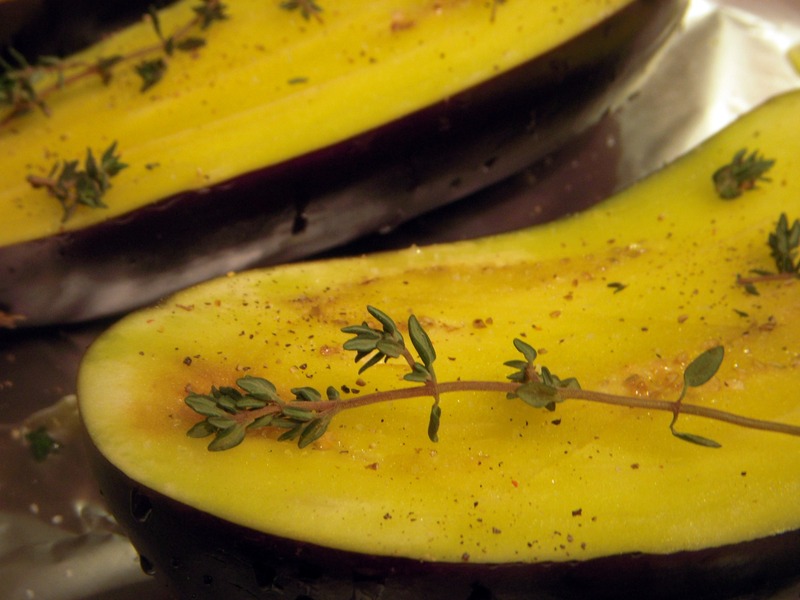 I started by roasting halved eggplants (or “aubergines” if you’re European) that smothered in olive oil and kissed with salt, pepper, and thyme. 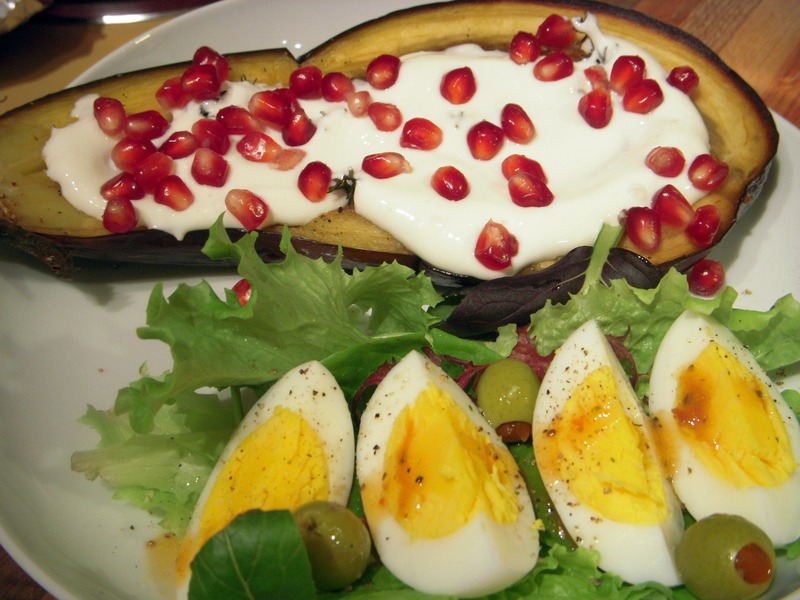 Once the eggplant is roasted to the point of deep golden perfection, it gets dressed with a buttermilk sauce and sprinkled with lots of pomegranate seeds. The combination of flavors were really complementary and highlighted the lovely pomegranate. If you’d like to try this for yourself, the recipe can be found on The Guardian’s website here, or you can watch a video of Ottolenghi preparing the dish here. What’s your favorite way to use a pomegranate? This entry was posted in In the Kitchen (recipes & more) and tagged cooking, eggplant, fruit, lindsay jean hard, ottolenghi, pomegranate. Bookmark the permalink. 2 Responses to Have You Tried: A Pomegranate? Great site! I write a weekly column on farmers’ markets in Maryland, so if you ever have an interesting ideas about farmers’ markets in MD, let me know. In the meantime, I look forward to reading your blog and learning about what’s going on in farmers’ markets across the country. Keep up the good work! It would be great to get more Maryland farmer’s markets on Real Time Farms – if you’re ever interested in doing a story on the free tools for markets and their vendors, let me know – would be great to reach out that way! Thanks for your support and encouragement (cara@realtimefarms.com).